In the Manuscripts & Folklife Archives section of the Department of Library Special Collections at Western Kentucky University in Bowling Green, Kentucky is a letter addressed to George W. Burchette, a civil war soldier born in Clinton County, Kentucky, who was in the service of one our nation's greatest presidents and recognized by another. George Washington Burchette was born on August 27, 1843 to John Calvin Burchette and Polly Branham. He was the grandson of Icil Burchett. On September 29, 1861, soon after the Civil War began, George enlisted in the Union Army's 12th Kentucky Cavalry, where he became a 1st Sergeant. He served until July 24, 1865. Although he fought in battles at Mill Springs, Fort Henry, Perryville and elsewhere, it is what he did at the war's end that he became known for. 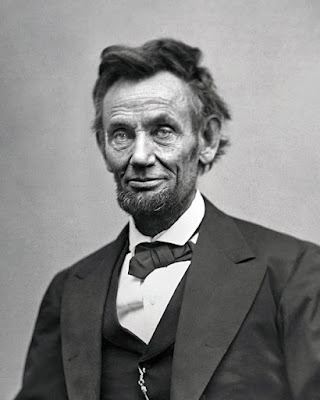 The story begins just after the assassination of President Abraham Lincoln, which occured on April 14, 1865, less than a week after the Civil War ended. 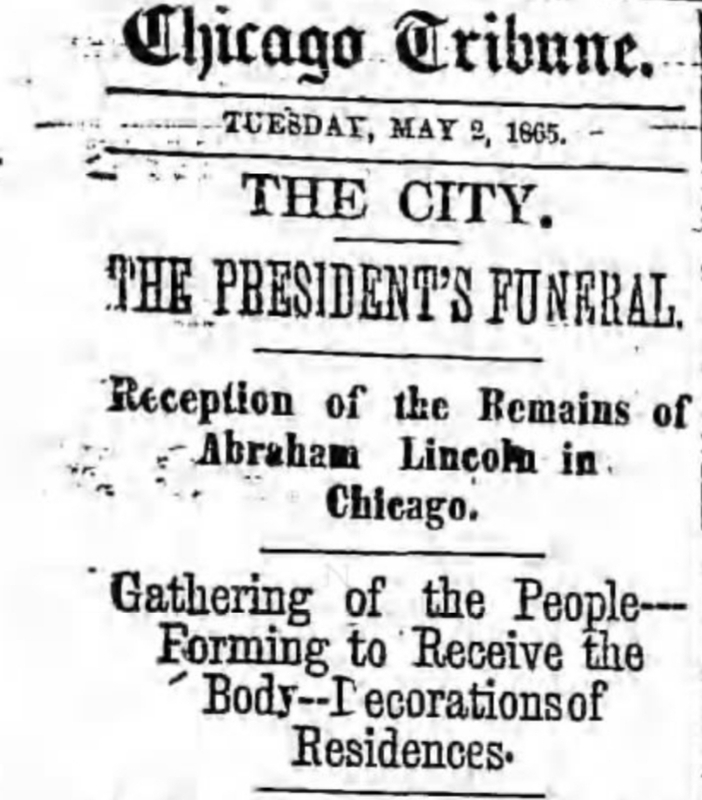 A funeral train, known as The Lincoln Special, was set up to transport the president's remains from Washington D.C. to his hometown of Springfield, Illinois, where he was to be buried. There were no television cameras or radio broadcasts in those days, only newspaper and telegraph. The Lincoln Special brought the slain president to the people. It allowed the nation to mourn together in a way that neither telegraph nor newspapers could do. 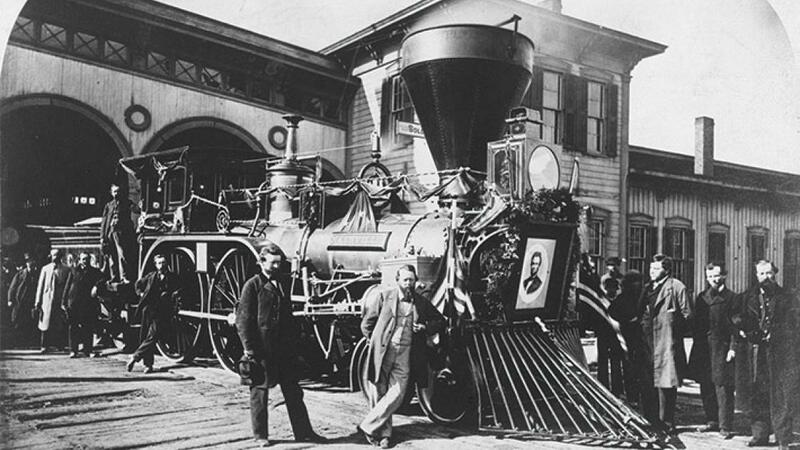 The train left Washington, D.C. on April 21 and traveled 1,654 miles through Washington, Maryland, Pennsylvania, New York, Ohio, Indiana and Illinois, never exceeding 20 mph, to the final stop at Springfield, arriving there on May 3. 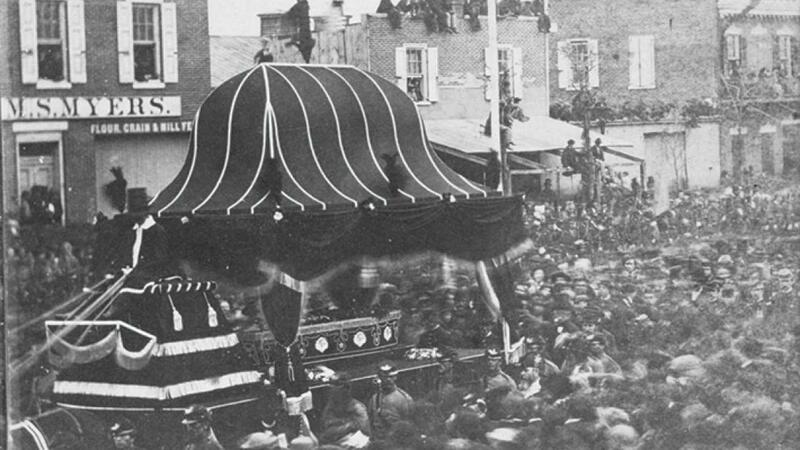 Following his assassination on April 14th, over the course of 20 days, the president's coffin made 14 stops between Washington DC. and Springfield, Illinois, retracing the route Lincoln had traveled to Washington as the president-elect on his way to his first inauguration, more than four years earlier. Millions of Americans came to view the train along the route and to participate in ceremonies and processions that were held at each stop. The normal routine of everyday living stopped; work, stores, businesses, schools...everything came to a standstill. 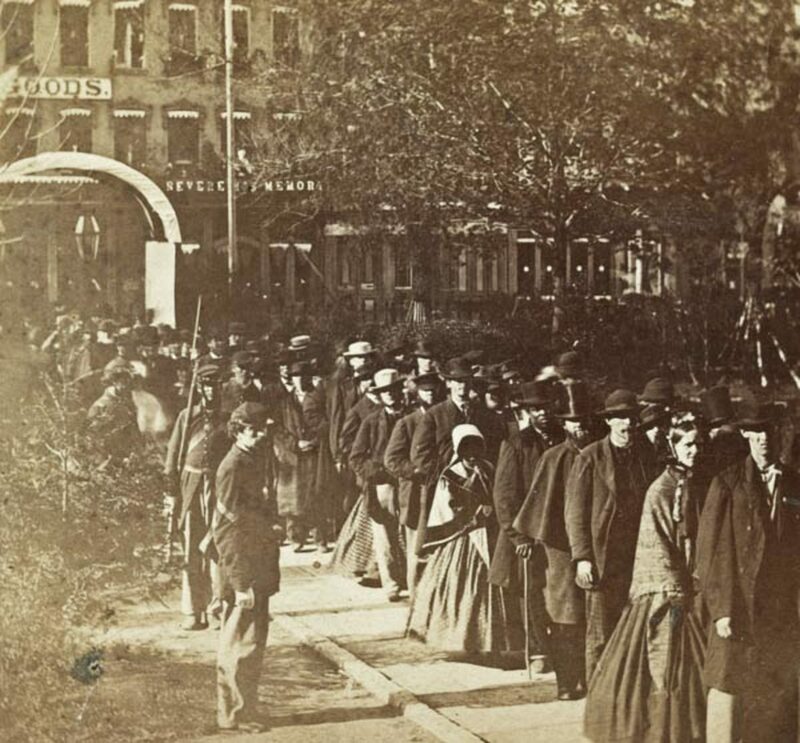 At each train depot,.and along the streets, tens of thousands of people came and stood in silence, waiting patiently for the Great Emancipator. Most wept. 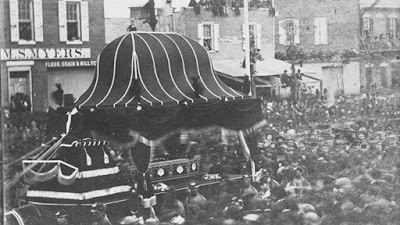 The Lincoln Special sojourned from Washington, D.C. through Baltimore Maryland, Harrisburg and Philadelphia Pennsylvania, New York City, Albany and Buffalo New York, Cleveland and Columbus Ohio, Indianapolis and Michigan City Indiana, and finally to Chicago, where George Washington Burchette had been chosen as one of 24 men who would serve as funeral guards (Guard of Honor) and for Lincoln's body as it was taken from the train depot to Cook County Courthouse to lie in state. The train left Chicago to the sound to tolling bells. 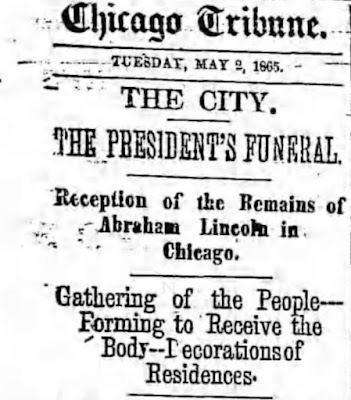 As it crossed through Illinois towards Lincoln’s home town, it passed large bonfires, large crowds and banners that read, “Come Home" and “Go To Thy Rest.” At Springfield, the coffin was loaded into an elaborate hearse pulled by six black horses in feathers and mourning blankets and bearing a silver plaque engraved with “A. L.” and taken to the state house. There, in the Hall of Representatives, where Lincoln gave his famous “House Divided” speech, approximately 75,000 people filed silently by the coffin as a band played hymns sung by a choir of 30 vocalists. 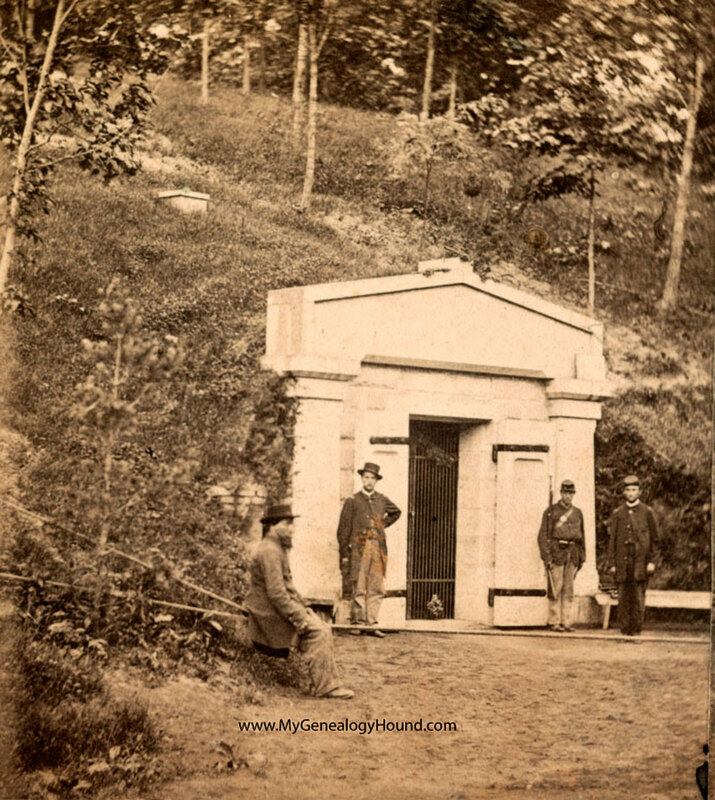 The next morning, Abraham Lincoln was laid to rest at Oak Ridge Cemetery. George Washington Burchette was 22 years old when President Lincoln was assassinated. 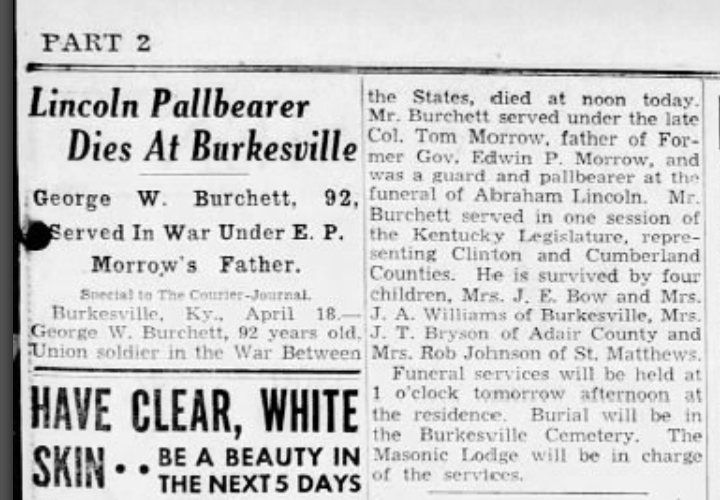 Being a member of the funeral guard brought him much notoriety back home in Cumberland and Clinton counties in Kentucky. After the war, he was appointed to oversee a group of 40 men who assisted the sheriff's of both counties in getting rid of bushwackers. He went on to become one of the Burkesville community's outstanding citizens and was elected state senator of Clinton and Cumberland counties. 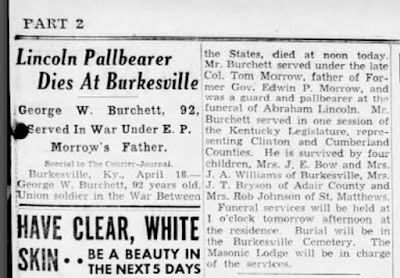 When he died in 1935, just four months shy of his 92nd birthday, Burchette was Cumberland County's last surviving Union soldier and the last surviving member of the 24 men who had been chosen as guards for President Lincoln's while it as in Chicago and subsequent trip to Springfield. A few weeks before his death, Burchette received a letter from President Franklin D. Roosevelt. In the letter, dated March 8, 1935, the president wrote "My dear Mr. Burchette, I am informed that you were a member of the funeral guard of Abraham Lincoln in Chicago and I am glad to send you this note to extend to you my personal greetings and my best wishes for your welfare. Very sincerely yours, President Franklin D. Roosevelt." George Washington Burchette died at noon on April 18, 1935, one month and 10 days after receiving that letter. A funeral was held the following day at his residence and he was buried at Burkesville Cemetery. After his death, the letter was placed in the Department of Library Special Collections at WKU, where it can be seen today. 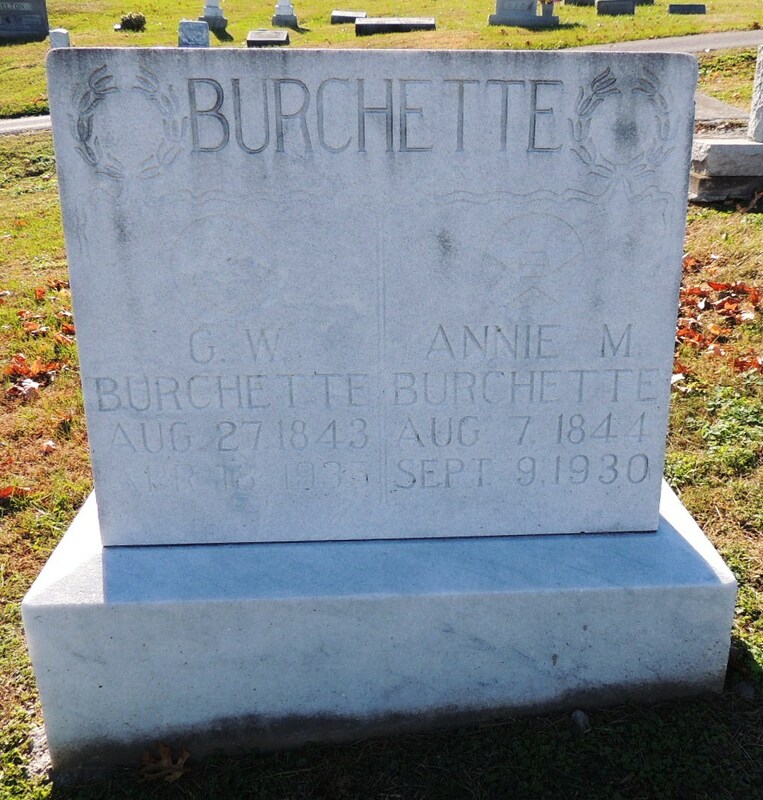 Burchette's grandfather, Icil Burchett, was killed by civil war guerrillas at his home in Clinton County. His great-grandfather, John Burchett, was a revolutionary war soldier in Virginia. The photocopy of the letter from President Franklin D. Roosevelt to George Burchette is courtesy of Library Special Collections, WKU. "Saviour, Like a Shepherd Lead Us"